We've put together a terrific lineup for our January edition of Tuesday Funk. The roster will feature Ryan Bartelmay, Kelly Swails, Christa Desir, Jasmine Davila, and Christopher Sweet. We'll also have a round of Haiku by Andrew, and new co-host Eden Robins most likely has something special in store as well. Add in delectable beers from around the world and you've got an evening that will warm your brain and your belly. 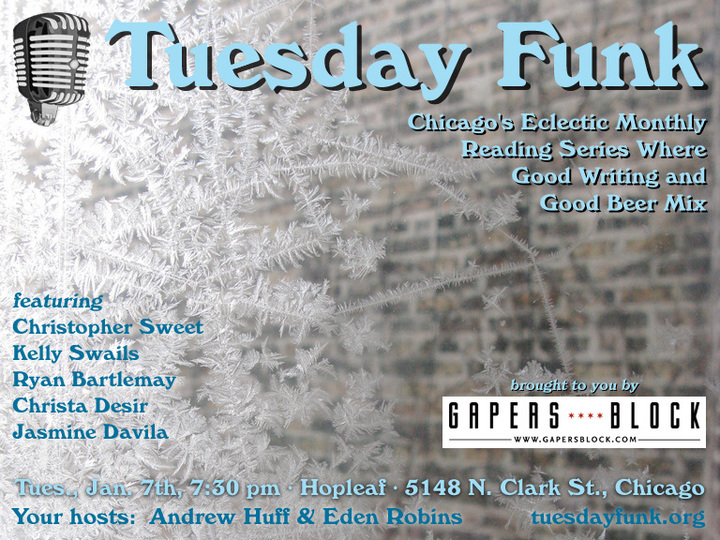 The evening gets underway with your hosts Andrew Huff and Eden Robins on Tuesday, January 7th, 2014, 7:30 pm, in the upstairs lounge at Hopleaf, 5148 N. Clark St., Chicago. Doors open at 7:00 pm, no earlier -- arrive early for a table and grab a beer from Mark at the bar. Admission is always free, but you must be 21 or older. And come early or stay late after for some great Belgian-style food downstairs. 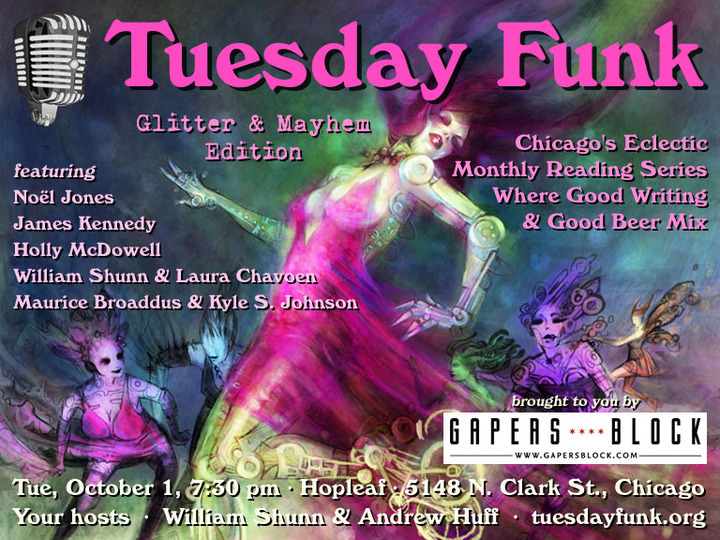 For November's Tuesday Funk, we've put together an all-star lineup so fabulous it just might pop your dome. 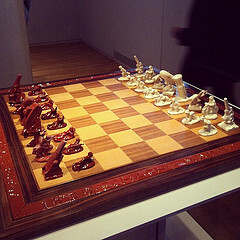 The roster will feature Paul McComas & Greg Starrett, Vojislav Pejović, J.H. Palmer, John Rich, and Rosamund Lannin. 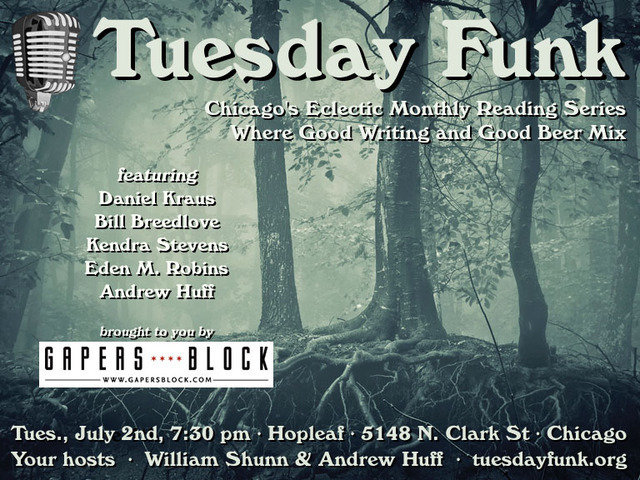 Throw in one of our patented Poems by Bill and a fistful of Haiku by Andrew, not to mention your pick of cold beers from around the world, and you've got all the ingredients for a classic evening of Chicago entertainment. 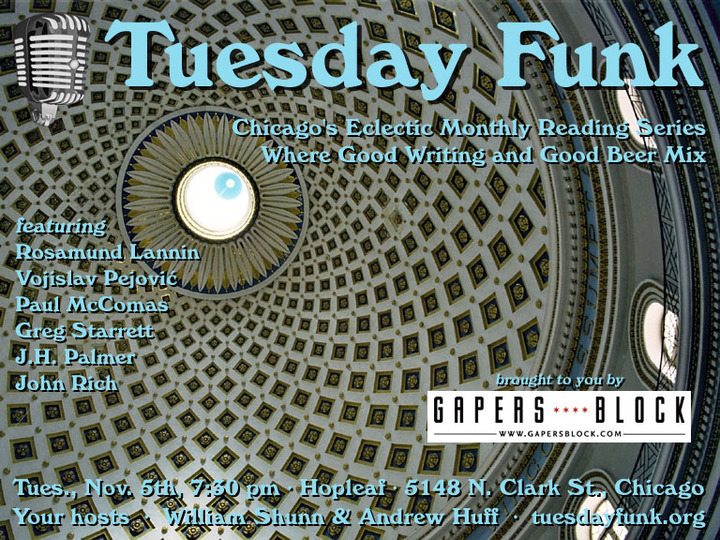 The evening gets underway with your hosts William Shunn and Andrew Huff on Tuesday, November 5th, 2013, 7:30 pm, in the upstairs lounge at Hopleaf, 5148 N. Clark St., Chicago. Arrive early for a table and grab a beer from Mark at the bar (where credit cards are now accepted!). We start seating at 7:00 pm and no earlier. Admission is always free, but you must be 21 or older. And come early or stay late after for some great Belgian-style food downstairs. Due to a scheduling conflict, J.H. Palmer will appear in place of Joseph O'Sullivan on November 5th. This post has been edited to reflect the change. Joseph O'Sullivan will appear at a future episode of Tuesday Funk. Brace yourself, because do we have an amazing Tuesday Funk lined up for you! For our 61st episode, we've put together a roster that includes MacArthur Fellowship winner Aleksandar Hemon, whose recent The Book of My Lives has been garnering acclaim around the world. As if that's not enough, we'll also have Virginia Konchan, Lania Knight, Norman Doucet, and another missionary story from co-host William Shunn. Throw in one of our patented Poems by Bill and a fistful of Haiku by Andrew, not to mention your pick of cold beers from around the world, and you've got all the ingredients for a legendary late-summer evening. 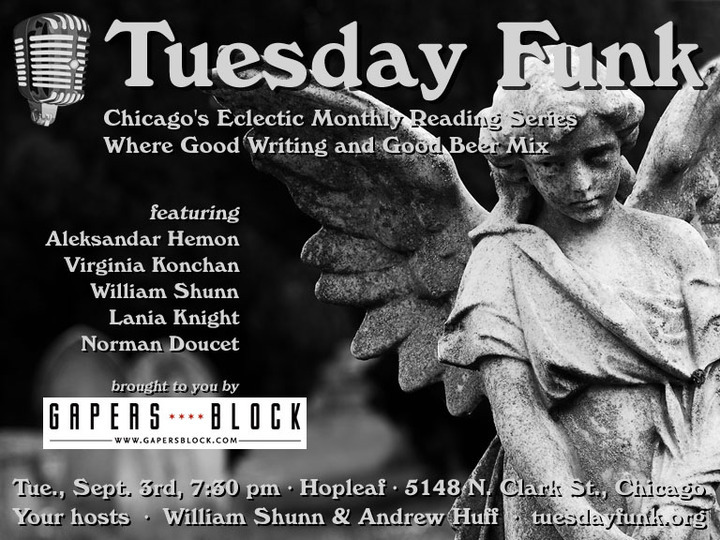 The evening gets underway with your hosts William Shunn and Andrew Huff on Tuesday, September 3rd, 2013, 7:30 pm, in the upstairs lounge at Hopleaf, 5148 N. Clark St., Chicago. Arrive early for a table and grab a beer from Mark at the bar (where credit cards are now accepted!). We start seating at 7:00 pm and no earlier. Admission is always free, but you must be 21 or older. And come early or stay late after for some great Belgian-style food downstairs. Five dozen episodes of Tuesday Funk?! We can hardly believe it ourselves, and to celebrate this startling milestone we've put together a fantastic lineup for you for your listening pleasure. The roster will feature Bradley P. Beaulieu, Jac Jemc, Steven H Silver, Maggie Jenkins, and Dmitry Samarov. Throw in one of our patented Poems by Bill, some Haiku by Andrew, and your pick of cold beers from around the world, and you've got all the ingredients for a hot August night of diamond quality. 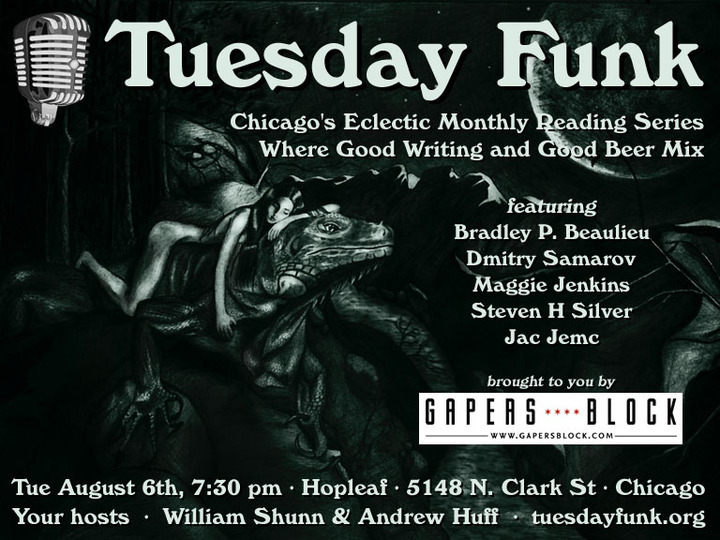 The evening gets underway with your hosts William Shunn and Andrew Huff on Tuesday, August 6th, 2013, 7:30 pm, in the upstairs lounge at Hopleaf, 5148 N. Clark St., Chicago. Arrive early for a table and grab a beer from Mark at the bar. We start seating at 7:00 pm and no earlier. Admission is always free, but you must be 21 or older. And come early or stay late after for some great Belgian-style food downstairs. 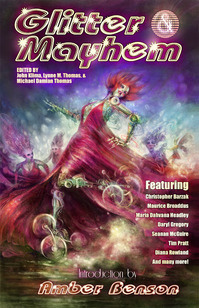 Tuesday Funk invites you to walk with us into a deep, dark literary forest this July. The roster will feature Daniel Kraus, Bill Breedlove, Kendra Stevens, Eden M. Robins, and our own Andrew Huff. Throw in one of our patented Poems by Bill and some Haiku by Andrew, not to mention your pick of cold beers from around the world, and you've got all the ingredients for an excursion you won't soon forget. 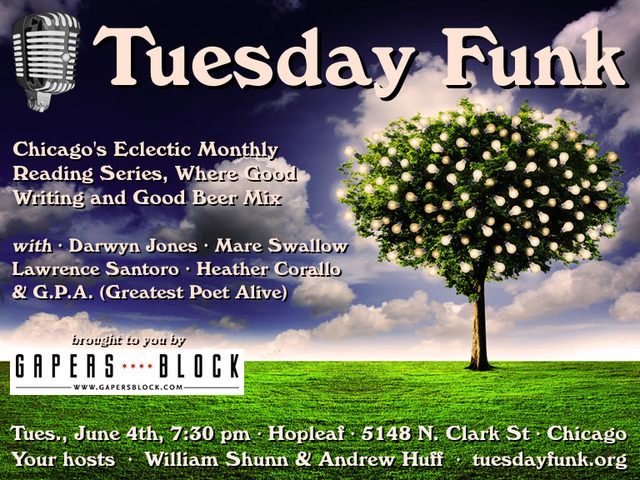 The evening gets underway with your hosts William Shunn and Andrew Huff on Tuesday, July 2nd, 2012, 7:30 pm, in the upstairs lounge at Hopleaf, 5148 N. Clark St., Chicago. Arrive early for a table and grab a beer from Mark at the bar (where credit cards are now accepted!). We start seating at 7:00 pm and no earlier. Admission is always free, but you must be 21 or older. And come early or stay late after for some great Belgian-style food downstairs. We've put together a leafy, green lineup for Tuesday Funk fit to feed a small village. The roster will feature Suzanne Clores, Mary Beth Hoerner, Robert McDonald, Dion Walton, and former co-host Sara Ross Witt. Throw in one of our patented Poems by Bill and some Haiku by Andrew, not to mention your pick of cold beers from around the world, and you've got all the ingredients for the most pleasant of spring evenings. 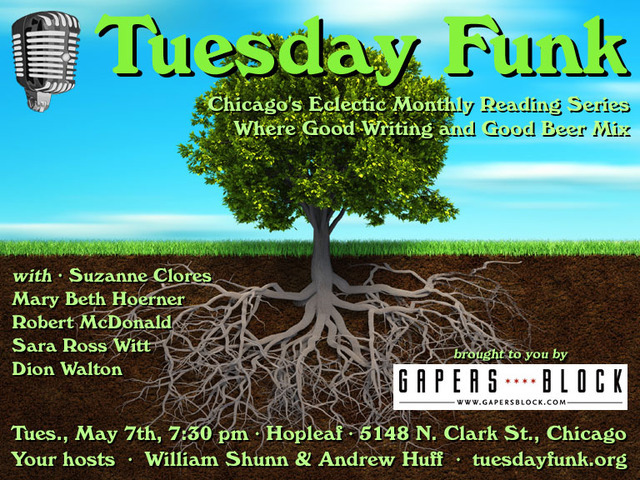 The festivities get underway with your hosts William Shunn and Andrew Huff on Tuesday, May 7th, 2013, 7:30 pm, in the upstairs lounge at Hopleaf, 5148 N. Clark St., Chicago. Arrive early for a table and grab a beer from Mark at the bar (where credit cards are now accepted!). We start seating at 7:00 pm and no earlier. Admission is always free, but you must be 21 or older. And come early or stay late after for some great Belgian-style food downstairs. We've put together an April lineup for Tuesday Funk fit to melt your cold heart at the end of this long winter. 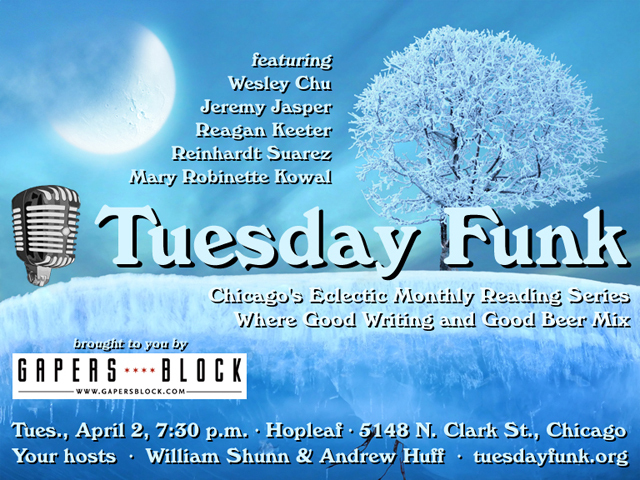 The roster will feature Mary Robinette Kowal, Jeremy Jasper, Wesley Chu, Reagan Keeter, and Tuesday Funk co-founder Reinhardt Suarez. Throw in one of our patented Poems by Bill, not to mention your pick of cold beers from around the world, and you've got all the ingredients for the perfect spring thaw. We'll also be welcoming our new host, Gapers Block's Andrew Huff, so you won't want to miss it! 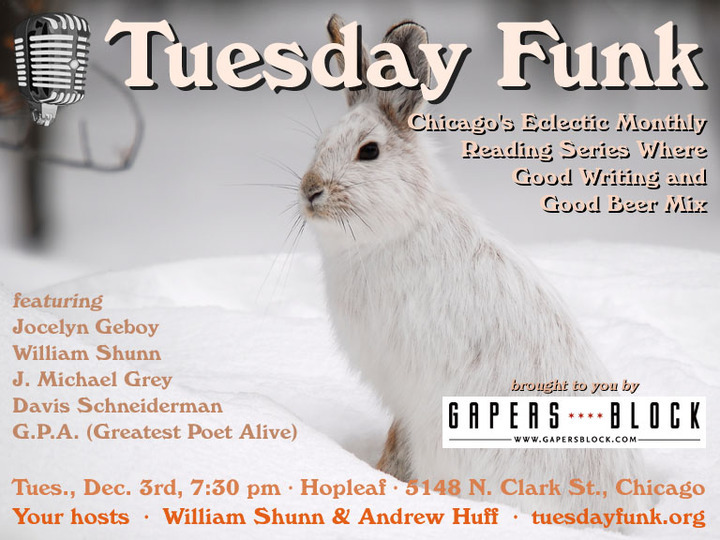 The evening gets underway with your hosts William Shunn and Andrew Huff on Tuesday, February 5th, 2012, 7:30 pm, in the upstairs lounge at Hopleaf, 5148 N. Clark St., Chicago. Arrive early for a table and grab a beer from Mark at the bar (where credit cards are now accepted!). We start seating at 7:00 pm and no earlier. Admission is always free, but you must be 21 or older. And come early or stay late after for some great Belgian-style food downstairs. This page is an archive of recent entries in the Hopleaf category. Haiku by Andrew is the previous category.